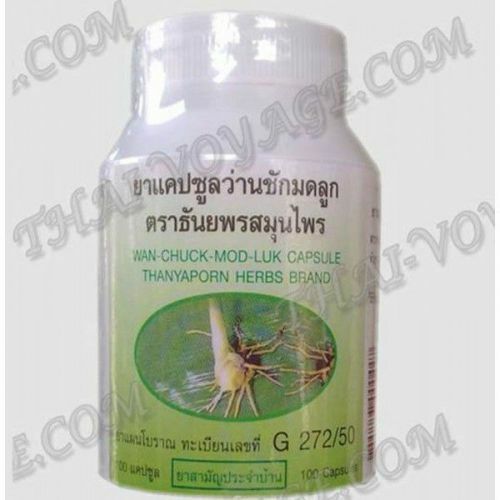 Capsules Wan Chuck Mod Luk - phytopreparation for women's health and infertility treatment. The main active component of the drug - Curcuma Xanthorrhiza (Javanese turmeric). Other names: Wan Chuck Mod Luk, Javanese turmeric, yellow root Javanese, Javanese Turmeric, Curcuma Xanthorrhizae Rhizoma, Temoe lawak, Temoelawak. Wan Chuck Mod Luk contributes to the rapid recovery of the body after birth, reduces pain syndromes, has antibacterial properties, prevents inflammatory processes, is used in diseases of the ovary, adhesive process, fungal infections. • Strengthen the walls of the uterus - womb medication heals, helps to normalize the position of the uterus (with the omission, and other defects), and strengthens the muscles of the uterus, and vaginal muscles. • Improve blood circulation of the pelvic organs, eliminating stagnation - prevention of exacerbations of chronic diseases of women, ovarian diseases, fungal infections, fibroids, and fibroids, as well as in violation of thyroid function. • Improvement of the Fallopian tubes, contribute to the elimination of adhesions. • Normalization of the microflora and the menstrual cycle. Each capsule contains 370 mg Curcuma Xanthorrhiza Roxb. Registration number: G272 / 50. Usage: 1-2 capsules 2 times a day before meals.